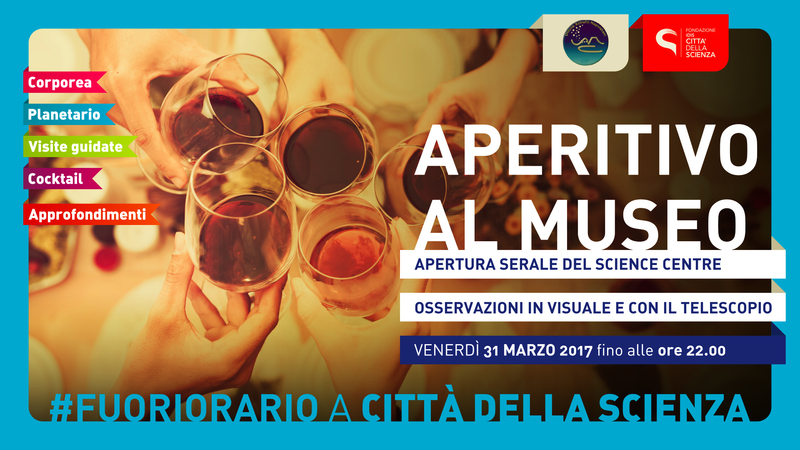 It will be a special day Friday, March 31 for Città della Scienza. To celebrate the rebirth of the museum complex and the opening of new, spectacular attractions, such as Corporea and 3D Planetarium, Città della Scienza will remain open until 22 and will propose to all visitors to take part in an “aperitif at the Museum.” An evening of celebration and engagement: to allow visitors to discover the rich offer of Città della Scienza, Corporea and Planetarium will remain exceptionally open until 22. Program is based on scheduled guided tours, workshops, special insights on health, digital manufacturing demonstrations and 3D printing. Special guest: the Union of Neapolitans Amateur Astronomers who will accompany visitors “to the stars”, through visual observation with the telescope. The bar of the Planetarium – by Terrazze Paradiso – will remain open to allow participants to enjoy cocktails and snacks.